Our news page will be the central point for all the latest news at MGS. Please come to this page everytime you visit the website. We are very sorry but due to the unpleasant weather we are having, we feel it is unlikely to improve or clear by Sunday, so have taken the decision to postponing this competition. 1.– Our next BD & Quest Club Shows are on Sunday 18th March, Tuesday 20th March and Saturday 7th April 2018, would you like to move your entries to one of these dates? 2.– We can credit your entries to a future date of your choice, please tell us which one? 3. – If you would like a refund this can be completed for you, but please note as per BD rules we will retain £2.50 per class admin fee. Please also note that if you have paid by MyRidingLife then the £1.50 booking fee will also sadly be unable to be refunded as this is a direct cost from MyRidingLife. Harry Junior! 15.2hh Black Gelding. 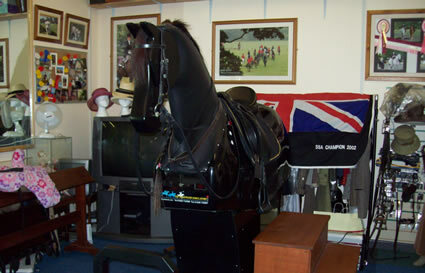 The first riding simulator to have 5 speeds :Walk, Sitting trot, Rising Trot, Working canter & Extended canter. This riding simulator is the ultimate school master horse. He always maintains a perfect rhythm, tempo and balance. He never bucks or misbehaves. He can change pace with a nudge of the legs and a squeeze of the reins will make him slow and stop. He does exactly what he is instructed to do all day long and never tires or breaks into a sweat! Walk, Sitting Trot, Rising Trot, Work without stirrups, collected canter, medium canter, cantering without stirrups, forward seat, jumping position, dressage seat and side saddle riding. Riders who are fearful of the real horse, the mature rider, riders who have lost confidence and disabled riders will find Harry Junior of great benefit. There are many more areas that will benefit from riding this horse Harry Junior and the team are also available for lecture / demonstrations, parties or social events etc. We aim to give new and experienced riders a great life-like lesson. FUN DAYS/ NIGHTS WITH HARRY JUNIOR! Designed and produced by Equine Affairs Ltd - The UK's Biggest Show Directory.